DUBOIS – Fall commencement ceremonies were held Thursday evening in Hiller Auditorium, marking the graduation of nearly 50 students from Penn State DuBois this fall semester. Bachelor and associate degrees were conferred in a wide range of disciplines. 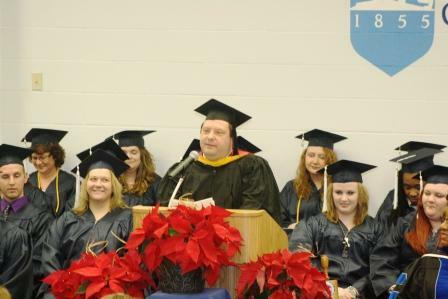 Jim Kuterbach, campus instructor of Human Development and Family Studies (HDFS) offered the commencement address. Kuterbach began teaching at Penn State DuBois in 2004. He holds a Bachelor’s degree in psychology and a Master’s degree in clinical psychology. He successfully defended his thesis for his Ph.D. in educational theory and policy in October, and will receive that degree in May. Kuterbach’s HDFS students go on to work in fields such as mental health, addiction counseling, behavioral counseling, probation and more. Kuterbach was named the DuBois Educational Foundation (DEF) Educator of the Year for 2011-12. Nominations for the Educator of the Year Award come from campus students who feel a faculty member has had a significant impact in the lives of those they teach. Besides his classroom duties, Kuterbach acts as the academic advisor for many of the HDFS students, assisting them with scheduling classes, and providing job and graduate school guidance. He assists in advising the HDFS Club, serves on the Enrollment Management Team, the Library committee, and the Early Intervention Team. He also supervises and mentors undergraduate research for several HDFS students.